*NEW* Cream "soft feel" fabric for our large foam wedge pillows. Wide surface, low incline memory (Vasco) Layered wedge shaped pillow. Dimensions approx 76cm x 66cm x 20.5cm profiling to 6.5cm at the lowest point. Ideal for acid reflux sufferers while sleeping. click on the image to have a close-up view of our all new pillow wedge fabric! 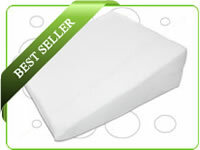 Foam pillow wedge with VP waterproof 2 way stretch fabric - NHS spec. Waterproof two way stretch stitched fabric version of the wide surface, low incline memory bed wedge. 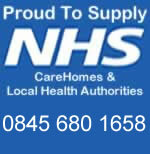 Prevents fluid ingress, ideal for for people who perspire a lot and incontinence sufferers. Spare VP (vapour permeable) waterproof bed wedge covers available. Cover colour may vary depending on stock.